Hawaiʻi Island police are asking the public for any information related to the theft of a State Highway owned backhoe from the northbound shoulder on Highway 11 near the 18-mile marker in Glenwood. 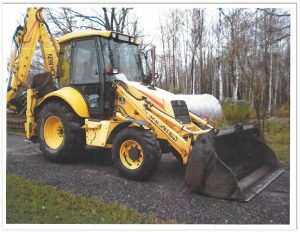 The removal of the New Holland brand backhoe, (valued at approximately $35,000), occurred during the late afternoon of, (December 4, 2017), into the early morning of, (December 5, 2017). Police ask anyone with information regarding the theft or the current location of the backhoe to contact Officer Bronsen Kaliloa at the Pāhoa Police Station number (808) 965-2716 or the Police Department’s non-emergency line at (808) 935-3311.